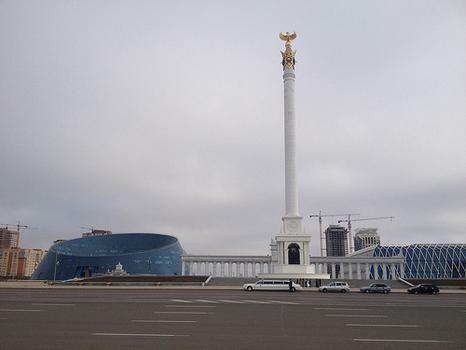 The Kazakh Eli Monument is a 91 m tall white marble column commemorating Kazakhstan's declaration of independence in 1991. The Kazakh Eli Monument is a 91 m tall white marble column commemorating Kazakhstan's declaration of independence in 1991. It has a mythical golden bird Samruk on top, symbolizing the aspirations of the Kazakh people for further development and prosperity. The pedestal has niches with bronze bas-reliefs depicting the First President and Kazakh people, Bravery, Creativity and Future. Behind it is a marble colonnade of 28 9-m high columns, beyond which is the Unity ensemble of 11 sculptures.